The following is the story of the return trip from Fort Garry to Red Lake, Minnesota in 1843. The account of the journey to Fort Garry was published in the April 1960 issue of Pageant. This is printed from an original manuscript in the Archives of Manitoba. The next morning, the last day of the year 1843, on awaking, we found ourselves and everything else covered about 5 inches deep with snow. A soft snow had fallen, and the wind had changed and formed a crust ... First, we found our fire all snowed out, and everything wet and covered with snow. Clearing away the snow and gathering the branches I called to Mr. Ayer for the matches, which he carried in a tin box in his coat pocket. Feeling for them, he jumped up suddenly, exclaiming "Why, they are lost. I'm sure I put the box in my pocket after kindling fire last night." Our matches were lost, and we were, as afterwards proved, ten day's travel from home, without means to kindle fire. The snow covered everything, we knew not where to search. We went about in every direction where we had been the night before, kicking up the snow in vain hopes of finding the box. In this manner most of the afternoon was spent. It finally occurred to me to find out which of the animals Mr. Ayer had fed with barley. Having gone over all but one without success I began to despair of finding it. "In my distress I cried unto the Lord" which was my habit at such times; yet feeling it (my) duty to use my utmost endeavours to obtain the de-sired object. So praying and kicking at the snow about the animal my last kick brought up the matches. Was it accident, or answer to prayer accompanied with work? I believe in casting all my cares upon Him who careth for me and have not been disappointed. The matches found, Mr. Ayers says "Now we will have some of that nice beef steak the good Scotch people gave us." The fire being kindled we went for the meat which consisted of two large pieces. But to our astonishment and dismay it was no where to be found. Whoever or whatever took it must have done so before the snow fell, as no tracks were visible. Noticing "Old Watch" warming his nose by the fire watching our movements I said "Mr. Ayer, I believe your dog has taken it." "Oh no," said he, "he never did such a thing. He is an honest dog." The old fellow gave his master a grateful wink and shut his eyes for a nap. Breakfast over and the cattle loosed to feed on the prairie about mid day we lay down for a rest. In a short time Mr. Ayer was sound asleep. Doubting the dog's honesty I determined to test him. Shutting my eyes as in sleep and occasionally opening one to notice his movements I found him quiet and apparently sleeping. Not satisfied, I began to snore ... which soon warned Old Watch that "the coast was clear." Slightly opening one eye I saw him wake up and look wistfully at us both, then get up and look around. Having satisfied himself that we were asleep he softly crept out of the camp and went cautiously into the bushes out of sight. Rising noiselessly I cut a switch and followed, and before he had broke his fast he felt the force of my arm and aroused his master with a dismal howl. Later in the day the other piece of meat was in like manner found, both almost intact. Poor Old Watch was a good dog but the temptation was too great. The next year he was killed and eaten by the Indians. An early start on New Year's morning brought us to the "Thieving River", about noon, where we entered the woods. The trail being seldom used by the Indians during the Summer, was very difficult to follow through the bushes. Before night we were drenched with rain, which, by change of wind, froze our clothes stiff while making camp. The next morning we struck off to the right for the Red Lake River as the only way of safety from being lost in the dense wilderness, hoping to be able to proceed up it on the ice nearly to the Lake. But having made the experiment we found the snow so deep on it that the ice had settled or cracked and let the water up so deep that it was next to impossible for the oxen to draw their trains. Our only way now was to go along its edges and over points across open swamps always keeping the river in view. Some days we only made from 5 to 10 miles headway. 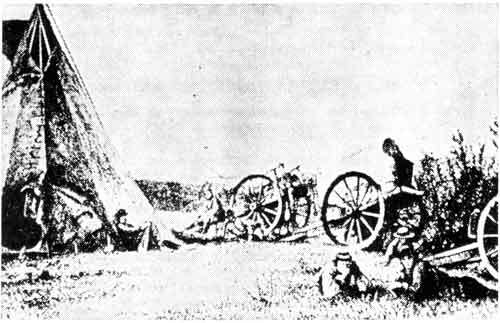 Red River Cart Camp - 1872. On Sat. morning a short distance from camp, Mr. Ayer being ahead called out "Keeshahwaindahgoozenim" (we are blessed, or fortunate). He had struck a snow shoe track of the Indians going in from their hunt leading up the river on the ice. But our rejoicing was short, for we had not proceeded far before the ice began to crack under our twelve head of cattle all in a row near the middle of the river. What to do we knew not. Halting the animals Mr. Ayer ran ahead to sound the ice while I stood by them praying, expecting every moment to see the ice give way under us unless gracious Providence saved us. Striking his axe in the middle of the river a few paces ahead of the foremost ox it went through the ice. Ice still cracking under us, we must act as well as pray. So we got the animals off on the left bank and went on a few rods where we found the river entirely open in the center, the swift and deep current had worn the ice away. By this we knew we could not be very far from Red Lake, but to our dismay we had gone off on the wrong side of the river. After a long search we found the Indian trail on the other side, but how to get our animals across was a question. Going down stream some distance we found a spot where we could cross them one at a time. Here again was another dilemma. The first one we got across broke in on the overflowed swamp and had to be pulled out. We finally succeeded in getting them all over to terra firma, some breaking through and some escaping. With feet bare to the snow from broken moccasins I cut wood long after dark for Sunday's use. While at supper we were surprised by the arrival of two of the fur trader's men who were on their way home with packs of furs from the Indians, they shared our camp and the next morning went to their post informing our families of our safety and relieving their anxiety. The "peep of day" on Monday found us some miles from our camp and at eleven o'clock at night, almost exhausted we reached our bark hut, thankful for even so humble a place to call "home."